I know the big joke (pre-patch especially) this year is that it was so easy to score. But as you’ll find out the more you play, the really good GKs are excellent shot stoppers this year. Regardless of your shot type and power, you need a clear line of sight for the best shot. Obviously if someone is right in front of you, they’ll block your shot. But you ever wonder how those long range wondergoals from crappy players go in, even from crappy players? It’s a mixture of bad keepers and line of sight. If you have a clear path to goal and power your shots correctly with decent aiming, the ball will simply go in. You can score 25 yarders with pretty much everyone, even your GK or bronze players. If you shoot the ball at a full sprint, it becomes harder to time the aiming and power. You carry your momentum into your shots, so try to keep that in mind as you ready yourself for the finish. Also, you never want to turn and shoot at the same time, unless it’s the only option available. Instead, you want to shoot in the same direction your player’s body is facing. This helps you maintain proper shooting form and you don’t have to twist your body strangely with some shoddy animations. In FIFA 17, you shot to the far post diagonally most of the time. It was what worked. 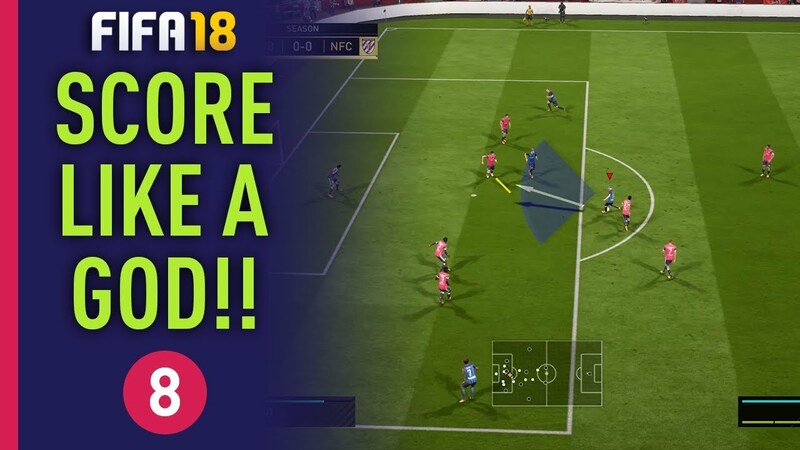 In FIFA 18, this still works, but the near post is also solid. The general rule of thumb is that if you need to adjust your body for a cross post shot but don’t have time, shoot it at the near post. Don’t be scared of near post shots! Of course, if you’re coming at the near post from a tight angle, it’ll be extremely difficult to slot it in, just like in real life. The further you are from goal, the more power you need to generate. If you’re outside the box, two-to-three bars of power (depends on distance and player) will do it. Aim for the top corners to make the keeper jump and stretch far. If you’re in the box, it would be ideal if you have the time to get to two bars, but often times you won’t. The reason I say this is because a lot of weaker shots get underpowered, making them easier for the keeper to save. You have less of a chance of missing with two bars inside the box than with one bar, assuming you have the time to power up. If you’re close to the keeper, keep your shot low (tap shoot a second time during your power up). If you’re closer to the edge of the box, you can still shoot high. Outside the box straight shot? Do it regularly, with two-to-three bars of power. Outside the box diagonal shot? If the coast is clear just do a regular shot, if there’s traffic in front of you and you need to curve it, do a finesse shot (hold R1). Finesse shots usually need more precise power and aiming. Inside the box? Do a low driven shot. If you’re pretty open you can just go for it, if there’s some traffic or the keeper is getting very close, you can hold R1 to curve it a bit more. Keeper way off his line in a 1v1 or just wildly mispositioned? Chip his stupid face! Hold L1 and shoot. You can chip to the far post from inside the edge of the box with really good players even.